We have been diving Tenerife since 1999. Aqua-Marina one of the longest established and most trusted dive centres in the Canary Islands. Popular with groups, individuals and families seeking a friendly and informal, yet professional environment. These are just some of the reasons why so many guests keep diving Tenerife with Aqua-Marina. Every time we go diving, the safety of all on board is of paramount importance. We always limit groups sizes in the water. This ensures not only that we provide more personalised service, but allow our dive team maximum control. This way, any problems which arise can be addressed before they escalate. There are always emergency oxygen, first aid supplies and surface support present when we are diving. All equipment is serviced and maintained well within limits dictated by the industry and local law. 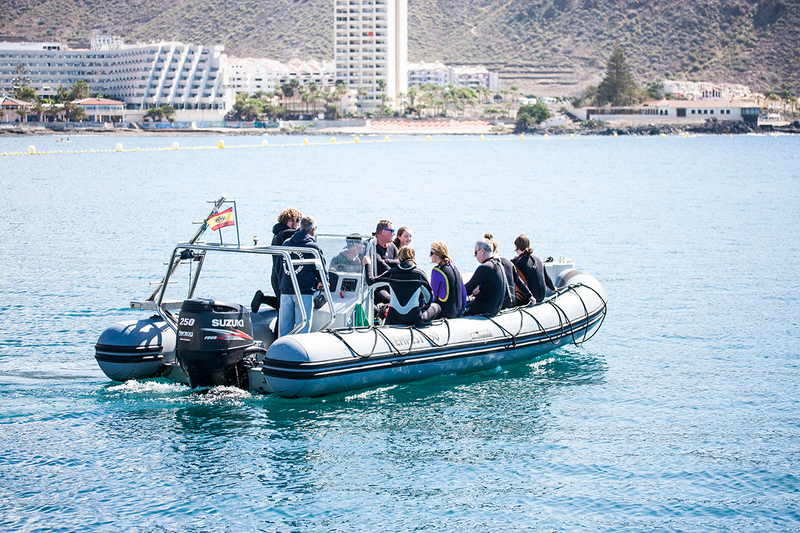 Our dive boat is a 7.5 metre Capelli RIB (Rigid-hull Inflatable Boat). It is specifically adapted for divers with equipment stowage and an easy-to-climb ladder. It is powered by a 250HP Sazuki engine and has a capacity for 14 people. The boat is permanently moored in the marina at Los Cristianos. This is the closest marina to the dive centre which means we have very quick and easy access to board. This is also the closest marina to some of the best dive sites around the Southern tip of the Tenerife; as well as up the West coast as far as Playa Paraiso. Los Cristianos marina is right next to Playa Las Vistas, a beautiful white-sand beach which is very popular with sun-seekers. For non-diving friends and family this is a lovely spot to rest and sunbathe for a few hours while waiting for you to return from your dives. From here there is quick and convenient access to the many shops, cafes and restaurants in Los Cristianos. Between dives we return to the beach to enjoy a leisurely surface interval at the Chiringuito (beach bar). Here we can take a coffee and small snack whilst we recharge our batteries for the next dive. 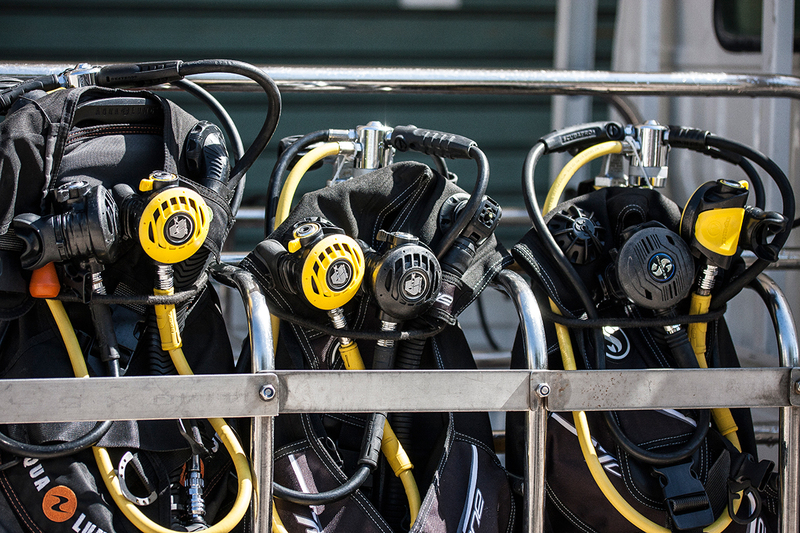 For those only making one dive, we will bring you back to the dive centre immediately upon your return. In partnership with our hosts, the Hotel Oro Blanco, we have access to their large swimming pool which we can use for our dive training. This allows the perfect conditions for confined water dive training which are never affected by the weather (as a training site at a beach would be). The best aspect of this is the fact that the pool is less than 10 metres from the dive centre, so there is no travelling – no waiting around – no fuss. 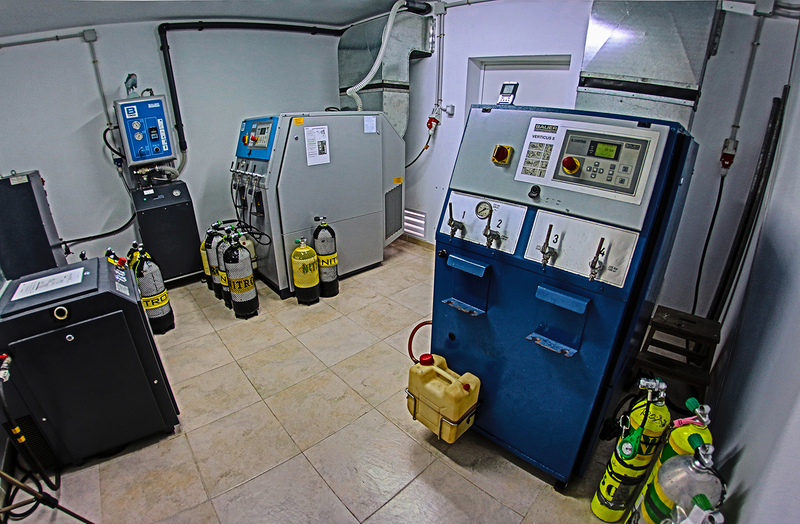 At the dive centre we have two Bauer compressors; one Air compressor and one Membrane Nitrox compressor. These compressors both feed directly into a separate tank filling room. 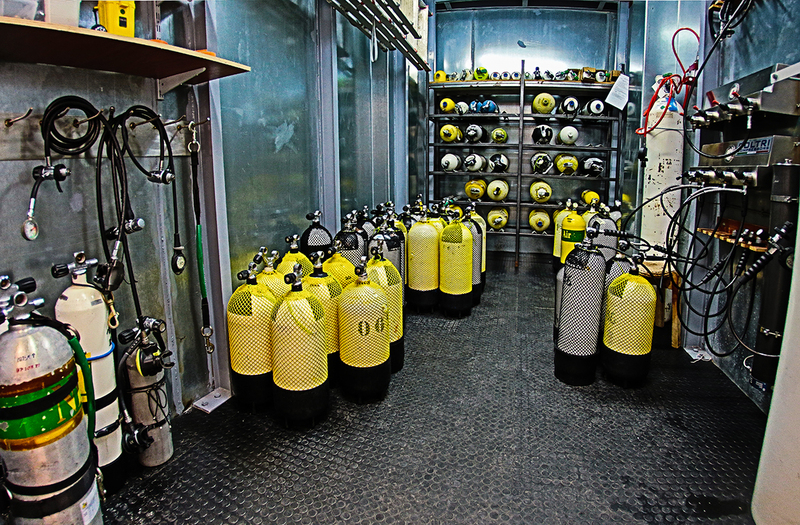 This steel lined filling room is our unique response to local regulations which require tanks being filled at a dive centre to be contained within a protected environment. This ensures minimise damage or injury in the unlikely event of an incident whilst filling. Whilst filling 4 cylinders at a time from our Nitrox compressor, our 320-litre, 300-bar air bank allows us to simultaneously fill up to 8 air cylinders in moments. This means that diving activities are never held up while we wait for cylinders to fill. Our 80 litre Oxygen bottle and booster pump allows us to create any Nitrox mix for decompression gas. We can provide pure O2 for Rebreather divers or for use in decompression. Collectively our dive staff have more than 100 years experience working in the diving industry and speak 5 European languages. They are qualified to teach more than 15 PADI specialties. They also hold professional qualifications in Technical diving, First-Aid provision and boat handling.